Traditional English Flint and steel with a medieval jute carry bag. Ideal Gift For any Bushcrafter or Outdoor Enthusiast. Do You Want A Fire Starter Which Will Create A Fire In Seconds Using A Popular Traditional Method? - HIGH QUALITY - Carbon Steel Ideal For A Fire Striker. - HAND FORGED - Each Piece is Unique And Hand Crafted To Perfection. - SIZED TO FIT - Large Enough To Fit All 4 Fingers For A Comfortable Fit And Maximum Impact. ENGLISH FLINT - Sourced from the British Woodlands. - DURABLE - Medieval Jute Carry Bag. - IDEAL GIFT KIT - Loved By Any Bushcrafter or Outdoor Enthusiast Who Appreciates Traditional Fire Starting Methods. This high-quality steel is made to create good sparks with minimal striking. When combined with our English flint pieces will create great, high temperature sparks with the lightest of strikes. Reliable, no matter the weather and long lasting with at least 50,000 strikes. 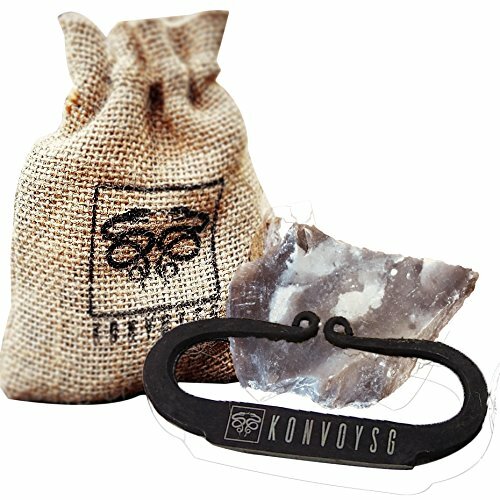 KonvoySG has a brand mission, to redefine all Survivalists through fear, design and the pursuit of innovation. We ensure that our products are made to the highest standards and give you complete peace of mind with our 30 Day No Quibble Money Back Guarantee and 12 months Manufacturers Guarantee. Grab Yours Whilst Stock Lasts. Add To Cart Now! If you have any questions about this product by KonvoySG, contact us by completing and submitting the form below. If you are looking for a specif part number, please include it with your message.